Melbourne’s rock music festival ONE ELECTRIC DAY has sold-out for the sixth year in a row, in record time. 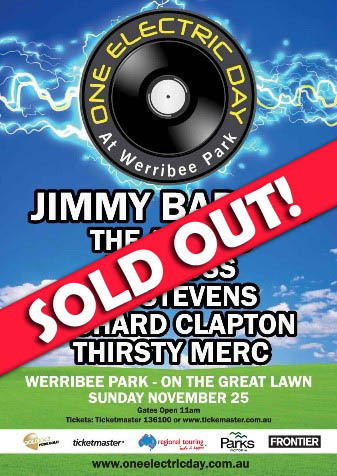 Tickets went on sale for the November one-day event at Werribee at 11am today. Earlier in the week, pre-sale tickets also sold-out the allocation before the end of the pre-sale period. ONE ELECTRIC DAY will see more than 10,000 music fans rock out with the likes of Jimmy Barnes, The Angels, Ian Moss, Jon Stevens, Richard Clapton and Thirsty Merc. The 2018 ONE ELECTRIC DAY is now sold-out.